Description: Perfectly set the tone for silly, not scary fun on Halloween. 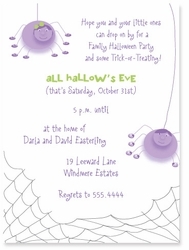 Invite friends over for some trick-or-treat fun with this whimsical spider invitation featuring what else? Spider kids!